Details relating to the Finnish Commemorative of 2015. Mint: Mint of Finland Ltd. 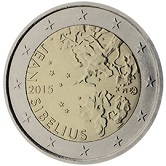 The coin commemorates the 150th anniversary of the birth of the famous Finnish composer Jean Sibelius. Sibelius can rightly be regarded as Finland’s greatest composer. He is well known for his symphonies, his violin concerto and various tone poems, of which the most famous is most probably Finlandia. This stirring piece aroused the desire of the Finnish people for independence - at the time Finlandia was first played Finland was a part of the Russian empire. In the inner circle depicts a night sky with stars as well as tree tops. This was no doubt chosen as Sibelius loved the natural beauty of his homeland and would often wander through the forests from which he is said to have received a great deal of inspiration for his compositions. Around the edge of the inner circle – from ten to six o’clock is the inscription “JEAN SIBELIUS”, interrupted at nine o’clock by the year of issue. The mint mark and country identification appear at three o’clock. 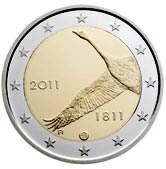 Return from Finnish Commemorative 2015 to euro coin collector.